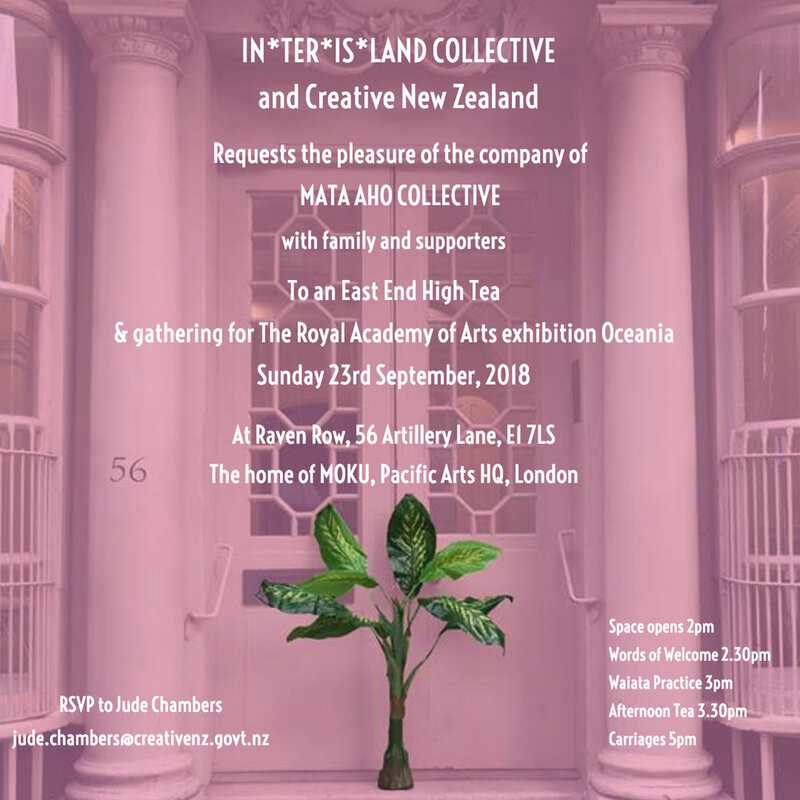 Working closely with Creative New Zealand’s International Team, In*ter*is*land Collective hosted *East End High Tea* for the artists, curators and government representatives connected to the curation of the exhibition Oceania at the Royal Academy of Arts in London. The afternoon tea, of was held at Raven Row on Sunday 23 September 2018 with many people in attendance, of particular importance the artists, who had come from Aotearoa including members of Mata Aho Collective - Bridget Reweti, Sarah Hudson, Terri Titau Fiona Pardington and Mark Adams, along with curator Peter Brunt and assistant Hanahiva Rose, Chair of Creative New Zealand Michael Moynahan and two kiwi’s from the Royal Academy team Hannah Murray (Assistant Exhibitions Manager) and Amy Macpherson (Deputy Head of Digital Content and Channels). An informal and social event, despite the rain falling relentlessly from Ranginui onto Papatuanuku. The menu was delicious and featured a range of stuffed local bagels, fresh scones with cream and jam and straight from the oven sausage rolls. Invitations were sent out in both English and Māori. A big shout out to Jude Chambers for her support and trust in us creating this event together.